Every hot tub, comes with a filtration system, usually consisting of a to filter cartridge, topside controls, plumbing, jets, a heater, etc.. The topside controls are programmed so filter cycles will run on a schedule, even when the spa is not in use. The water comes out through the jets and is pumped through the filter media, goes through the bottom suction, passes through the plumbing and heater housing and is pumped out the jets again by the spa or circulation pumps. Since the water circulation is automatic, many spa owners do not understand how hard their spa filters work to keep water safe. However, nothing is more important to help maintain your spa water quality than your filter cartridge. Best practices call for removing your filter each week and rinsing it with the garden hose. Once a month, you should take it out and let it sit overnight in a bucket with water and filter cleaning solution. It is best to keep a spare filter on hand so you can pop it in when you are cleaning the used one. Never run your spa without the filter in place. You will notice your white filter turning grey over time as contaminants and dirt get trapped within the filter media. The filter will look lighter again after a good cleaning. You can also purchase a filter brush to help you clean the particles and debris that get trapped inside the filter or spunbound media. Spa filters generally need to be replaced each year as filter media gets clogged or worn out. Otherwise, they will no longer be effective in trapping the smaller bacteria, debris and oils that are in your spa water. If your filter has turned dark grey, you will want to replace it. The surface area of the filter will depend on the size of the spa as well as the number of jets, flow rate per jet and other factors. A typical 5-6 person spa will usually have a 50 square foot filter, since larger spas hold more water and need a higher capacity. 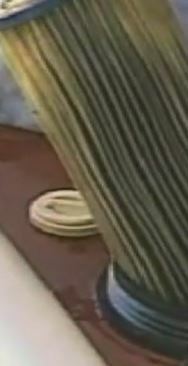 Look for markings on the ends of your current filter so you can buy the correct replacement. If you don’t see any markings, you will need to measure the length, diameter and inner hole diameter to choose a proper replacement, or consult the spa manufacturer/spa manual. While it does cost money to change your filter, it can save you much bigger issues. A clean, properly functioning filter will prevent water quality issues – which could lead to health issues for hot tub bathers. Ensuring your guests shower before entering the hot tub will help prevent germs and oils from entering the spa water, so water will stay cleaner. Dirty filters make water balance and maintenance much more difficult. If you don’t maintain your spa filter, you will spend a lot more on chemicals – trying to keep the spa water balanced. Your pH levels may be off, you may notice discoloration, algae, odors or foam. If your water becomes too dirty or too saturated with chemicals, then your only option will be to drain, clean and refill the spa. If you don’t take care of the filter, this will become a recurring problem. Dirty filters will cause your expensive spa equipment to work much harder and use more energy. Generally, when you see a “Flo” error on your controls, it’s due to a clogged filter that is preventing the water from flowing properly. Dirty water may be too acidic or alkaline, leading to corrosion or problems with your expensive spa heater or pump. Water that is not properly filtered and full of oil and debris can also clog plumbing and jets. Similar to how you need to regularly maintain an oil filter on a car to prevent expensive maintenance issues – you need to take the same precautions with a spa filter. If you are a spa owner, you should be familiar with the location of your filter and how to remove the cartridge. If you are looking to purchase a spa, check for ones with top loading filter systems that allow you to remove the dirty filter cartridge without dragging it through the spa water, which allows contaminants to reenter your water. 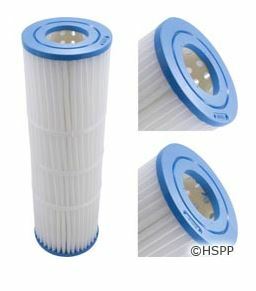 The easy way to maintain your spa filter is to purchase an extra one so you always have a spare filter on hand. Get test strips to check the water quality, add chemicals as needed, plus remove and rinse your filter each week. When you take the filter out to soak in overnight solution, let it dry completely before putting it in the spa again. Compared to the serious issues a dirty filter can cause, maintaining your hot tub filter makes a lot of sense (cents!). Get the best price on bulk spa filters and enjoy your soak with peace of mind!